Massachusetts newest boxing promotional company, Shearns Boxing Promotions will showcase their inaugural boxing event, “Every Man for Himself” on Friday, March 15th at The Palladium in Worcester, Massachusetts. The seven-bout fight card will be headlined by rising 160-pound prospect, Kendrick Ball Jr., who will fight for the vacant New England middleweight title. “I was planning [former three-time, two-division world champion] Jose Antonio Rivera’s next fight which was supposed to take place in March and I already had a date and venue booked in Worcester, so when his bout fell through, I decided it was a good opportunity to form my own boxing promotional company,” said Chuck Shearns. So, he enlisted the help of his wife, Karen, and his two daughters, Kayla and Olivia, and together they formed Shearns Boxing Promotions. Shearns, who is a licensed matchmaker, will be responsible for the contracts and commission relations, in addition to promoting, while Karen, will use her accounting background to handle the finances. Kayla and Olivia will take care of the marketing/social media, and event management/operations, respectively. Shearns has gained invaluable promotional experience by running ten boxing events over the last two and a half years. He worked with Jose and AJ Rivera at Rivera Entertainment Promotions and he co-promoted Granite Chin Promotions, alongside professional boxer, Chris Traietti. He also has an inside perspective from the fighter’s point of view as a former professional boxer (3-1, 2 KOs). “Every Man for Himself” will feature hometown favorite, Kendrick “Peppa” Ball Jr. (11-1-2, 8 KOs) against upset-minded, Danny “Feel Good Hollywood” Rosenberger (4-6-4, 1 KO) in the main event. In the co-feature, unbeaten welterweight, Wilfredo “El Sucaro” Pagan (5-0, 3 KOs) will square off against Carlos Galindo (1-7). The undercard will consist of Owen Minor, who will make his long-awaited professional heavyweight debut against Corey Morley (0-2-1), while undefeated light heavyweight, Angel Camacho Jr. (15-0, 5 KOs) will return to the ring after a three-year absent to take on Larry Smith (10-39-1, 7 KOs). 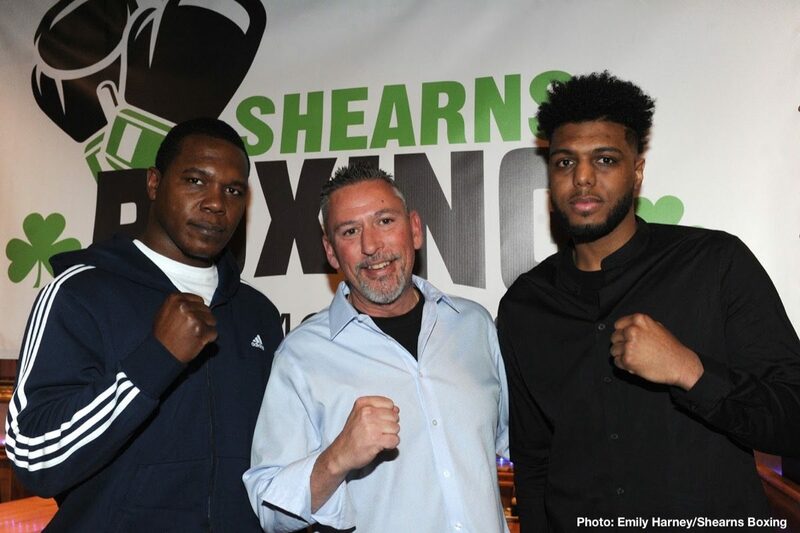 Shearns formed his own boxing promotional company in large part because he wanted to provide New England fighters with a platform in which they can showcase their talents and advance their careers by fighting on a consistent basis. For example, fight fans will get an opportunity to see Ball Jr. fight in the main event for a regional belt in front of his hometown crowd before he goes onto the national stage, as well as heavily decorated amateur, Minor, who has a great deal of potential at the professional level. In order to accomplish his goal of featuring quality, action-packed bouts, Shearns is willing to work with, not against other boxing promoters, which something that does not happen as often as it should in this sport. For this upcoming fight, Shearns teamed up with Jimmy Burchfield’s Classic Entertainment & Sports to bring his fighters, Ball Jr. and Camacho Jr. to fight on this fight card. Doors for “Every Man for Himself” will open at 6 p.m. with the first bout starting at 7 p.m. Tickets can be purchased online or at thepalladium.net. Shearns Boxing Promotions next fight card will be tentatively planned for June 14th, also at The Palladium when Rivera (42-6-1, 24 KOs) will box for the fifty and presumably, final time against an opponent to be named at a later date. For more information on Shearns Boxing Promotions and the latest updates on their upcoming boxing events, friend them on Facebook.com/ ShearnsBoxingPromotions and add them on Twitter @ShearnsBoxing.